This topic describes best practices for accessibility of text in an app, by assuring that colors and backgrounds satisfy the necessary contrast ratio. This topic also discusses the Microsoft UI Automation roles that text elements in a Universal Windows Platform (UWP) app can have, and best practices for text in graphics. Although users always have the option to switch to a high-contrast mode, your app design for text should regard that option as a last resort. A much better practice is to make sure that your app text meets certain established guidelines for the level of contrast between text and its background. Evaluation of the level of contrast is based on deterministic techniques that do not consider color hue. For example, if you have red text on a green background, that text might not be readable to someone with a color blindness impairment. Checking and correcting the contrast ratio can prevent these types of accessibility issues. The recommendations for text contrast documented here are based on a web accessibility standard, G18: Ensuring that a contrast ratio of at least 4.5:1 exists between text (and images of text) and background behind the text. This guidance exists in the W3C Techniques for WCAG 2.0 specification. Some of the tools listed by Techniques for WCAG 2.0 G18 can't be used interactively with a UWP app. You may need to enter foreground and background color values manually in the tool, or make screen captures of app UI and then run the contrast ratio tool over the screen capture image. When a user types into an entry field and a list of potential suggestions appears, this type of scenario is called auto-suggest. 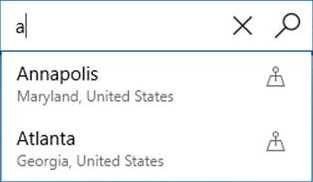 This is common in the To: line of a mail field, the Cortana search box in Windows, the URL entry field in Microsoft Edge, the location entry field in the Weather app, and so on. If you are using a XAML AutosuggestBox or the HTML intrinsic controls, then this experience is already hooked up for you by default. To make this experience accessible the entry field and the list must be associated. This is explained in the Implementing auto-suggest section. To make this experience accessible the entry field and the list must be associated in the UIA tree. This association is done with the UIA_ControllerForPropertyId property in desktop apps or the ControlledPeers property in UWP apps. At a high level there are 2 types of auto-suggest experiences. 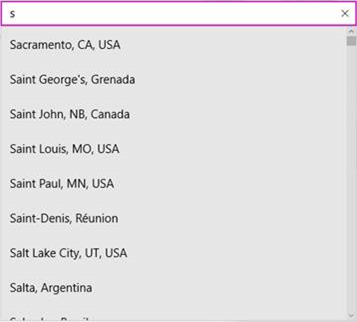 If a default selection is made in the list, Narrator looks for a UIA_SelectionItem_ElementSelectedEventId event in a desktop app, or the AutomationEvents.SelectionItemPatternOnElementSelected event to be fired in a UWP app. Every time the selection changes, when the user types another letter and the suggestions have been updated or when a user navigates through the list, the ElementSelected event should be fired. If there is no default selection, such as in the Weather app’s location box, then Narrator looks for the desktop UIA_LayoutInvalidatedEventId event or the UWP LayoutInvalidated event to be fired on the list every time the list is updated. 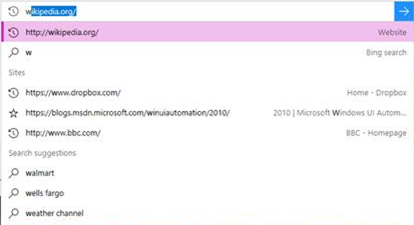 If you are using the default XAML AutosuggestBox, then everything is already hooked up for you. If you are making your own auto-suggest experience using a TextBox and a list then you will need to set the list as AutomationProperties.ControlledPeers on the TextBox. You must fire the AutomationPropertyChanged event for the ControlledPeers property every time you add or remove this property and also fire your own SelectionItemPatternOnElementSelected events or LayoutInvalidated events depending on your type of scenario, which was explained previously in this article. If you are creating your own controls, you must set up your own ARIA controls, which are explained in the W3C standards. Users can have difficulty reading text in an app when the fonts uses are simply too small, so make sure any text in your application is a reasonable size in the first place. Various text elements and controls have an IsTextScaleFactorEnabled property. This property has the value true by default. When true, the size of text in that element can be scaled. The scaling affects text that has a small FontSize to a greater degree than it affects text that has a large FontSize. You can disable automatic resizing by setting an element's IsTextScaleFactorEnabled property to false. See Text scaling for more details. Add the following markup to an app and run it. Adjust the Text size setting, and see what happens to each TextBlock. <TextBlock Text="In this case, IsTextScaleFactorEnabled has been left set to its default value of true." <TextBlock Text="In this case, IsTextScaleFactorEnabled has been set to false." We don't recommend that you disable text scaling as scaling UI text universally across all apps is an important accessibility experience for users. The value of TextScaleFactor is a double in the range [1,2.25]. The smallest text is scaled up by this amount. You might be able to use the value to, say, scale graphics to match the text. But remember that not all text is scaled by the same factor. Generally speaking, the larger text is to begin with, the less it’s affected by scaling.